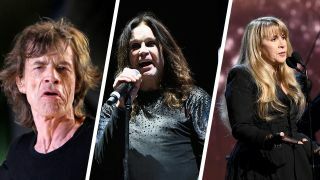 Ozzy Osbourne's current No More Tours II tour - the sequel to the Mo More Tours tour of 1992 (Ozzy was clearly beleaguered enough to consider retiring 27 years ago) - has been beset by illness and injury, and the dates now stretch into 2020. When Bob Seger launched his Runaway Train tour in 2017, he lasted only 13 of the 32 shows before his vertebrae came a-callin' and the rest of the tour was postponed. After months of physiotherapy, he's back on the road, still fulfilling those obligations. Brian May has a long list of Rhapsody dates to fulfil with Queen and Adam Lambert, but just two years ago he cancelled a UK tour in order to deal with a persistent illness he described as "destroying my energy and my will." We could go on. And we will. Examine the awful list of musicians we've lost over the last few years, and the common denominator in almost every case is the same: they were still active. They might not be recording, but they were on the road, unlike the rest of us. While we look forward to sedentary retirements they're piling up the milage, pounding the boards, moving from hotel to hotel and accumulating air miles. It's not a healthy life style, and it's no wonder so many are susceptible to illness. No one's denying a musician's right to tour. Once you've experienced the undiluted love a crowd can offer it must be a hard thing to forego. And as for the "they don't need any more money" argument for retirement, well, when did that apply to anyone, ever? It's our fault. Every time a band tours, we get a diminished version of the previous experience, and we still pay up. The Rolling Stones of 2018 may have been a blast, but were the No Filter tour dates really as good as the Bigger Bang shows a decade ago? Or the Voodoo Lounge dates the decade before that? At some point diminishing returns must come into affect, and performing with a band is an athletic task. Usain Bolt retired at 31, so why are we expecting our rock stars to play into their 70s? Why do we go? Is it just to be in the same room as these legends, one last time until the next time? Is it to pay tribute to who they used to be? Look at Brian Wilson: there's no doubting his genius, but if you distill his career down to the bits that really, absolutely matter, you're looking at an eighteen-month stretch more than half a century ago. Yet, as a live draw he's bigger than he's ever been. Why can't we let rock stars retire? The truth is we know the truth. We've struck bargains with our favourite musicians. We've given them a career and they've given us a lifetime full of memories. And that's the key word: lifetime. They've been an intimate part of our relationships and they've been there when others haven't. They're around for the birth of our children. They've filled our homes and soundtracked our summers. And they're still doing it. There's no statute of limitations on such a deal. It goes on until the very end, and is only torn up when one party or the other topples off the stage one final time and heads off into the darkness. Rock stars don't burn out. They don't fade away. They just stop. Usually without warning. Usually when we least expect it. And never when we're ready.